An interactive map for viewing rare and endangered species occurrences and more. 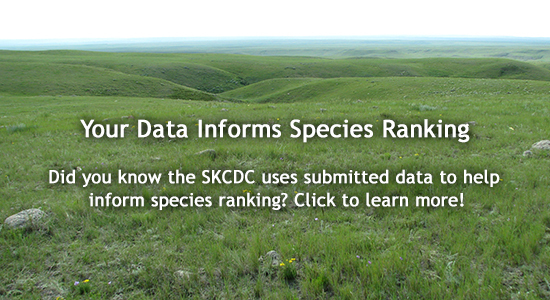 March 25th, 2019: The Native Plant Society of Saskatchewan (NPSS) and Saskatchewan Conservation Data Centre, on behalf of the Botanical Assessment Working Group, are pleased to announce the Vern Harms Important Plant Areas (IPA) of Saskatchewan program. The IPA program is an international effort to identify and conserve a region’s most important places for wild plant and fungal diversity. 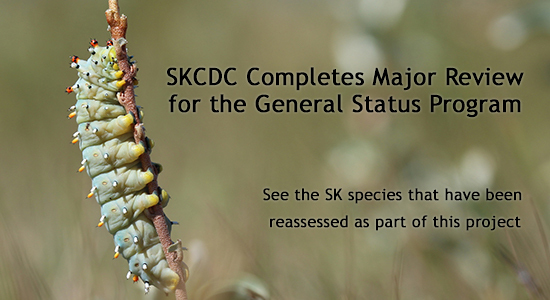 Eight sites in Saskatchewan have already been designated, and information on these will be available in the spring. Anyone can nominate a site, provided it meets certain criteria. More information on the program, site criteria, and how to nominate a site can be found on the NPSS website. Nominations will be adjudicated twice a year in April and October (next intake is for October 2019). Although an IPA designation is not legally binding, partners hope that such a designation will afford the sites extra avoidance/mitigation consideration should they ever be subject to a development, and will spur land managers to make decisions with outcomes that will benefit plant species of concern, plant diversity and sensitive habitats. Although locations of privately owned IPAs will not necessarily be available to the public, they will be made available on the Ministry of Environment’s HABISask application to users with data sharing agreements (e.g. only visible to those who login). Questions about the IPA program can be directed to the NPSS or SKCDC. March 18th, 2019: The iMapInvasives Network is excited to announce that the iMapInvasives platform is undergoing major changes this year, leading to a new and greatly improved iMapInvasives 3.0! Current iMapInvasives users will transition to the new platform in Spring 2019. See the iMapInvasives website for details and timelines! Please note that iMapInvasives will be offline from April 1st until the new platform is launched on April 19th. 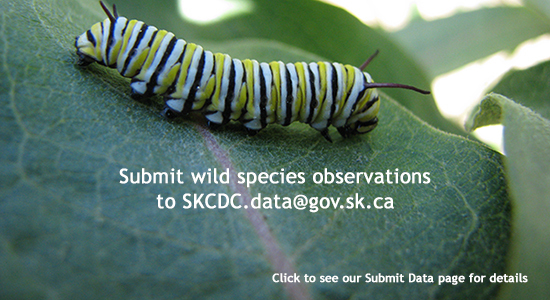 If you have further questions please contact imap.invasives@gov.sk.ca. February 13th, 2019: All of our species lists have been updated and posted to our Species List page. Notable changes are to birds which have been updated to better match the latest Check-list of North American Birds from the American Ornithological Society. Four letter codes have also been added to the vertebrate list in Excel. Furthermore, vascular and non-vascular plant lists by ecoregion have been updated with more recent data. December 21st, 2018: In the most recent COSEWIC meeting, Greater Short-horned Lizard and Pale Yellow Dune Moth were two Saskatchewan species that were reassessed. The Pale Yellow Dune Moth remains at Special Concern, while the Greater Short-horned Lizard has changed from a COSEWIC status of Endangered to Special Concern. 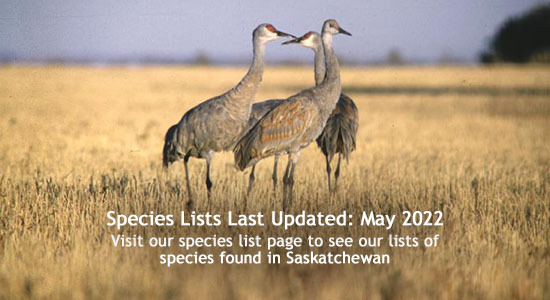 The vertebrate species lists have been updated to reflect this change. Refer to the Government of Canada's COSEWIC web page for details.